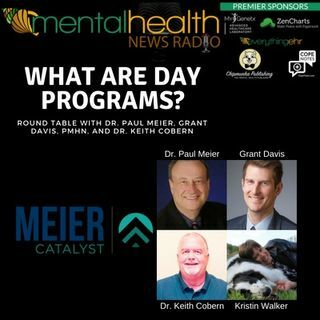 Join Kristin Sunanta Walker, Dr. Keith Cobern, Dr. Paul Meier, and Grant Davis as they discuss the effective of mental health day programs on this weeks Round Table discussion. Dr. Paul Meier is the founder of www.meierclinics.com, a best-selling author and practicing psychiatrist. Grant Davis is new to the show and is a psychiatric nurse practitioner. Grant provides psychiatric medication management for children, adolescents, and adults. His approach to medication management is client ... Más informaciones focused and collaborative based on information shared between clinician and the client. Grant believes that a strong therapeutic relationship between clinician and patient is vital for positive mental health outcomes. Dr. Keith Cobern has been the director of the Richardson, TX Meier Clinic day program for many years. Bachelor of Arts degree in Religion, Philosophy and Sociology from Dallas Baptist University. Master of Arts degree in Marriage and Family Counseling and Doctorate degree in Psychology from Southwestern Baptist Theological Seminary. Licensed in Texas as a Licensed Professional Counselor and a Licensed Marriage and Family Therapist.